There is a small tower. 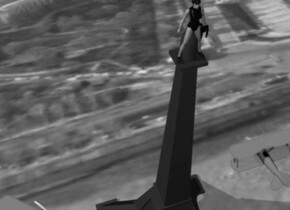 on top of the tower is an enormous gorilla. The gorilla faces northwest. The gorilla is 30 feet tall. to the right of the tower is a very big airplane. The airplane faces the gorilla. The airplane is 500 feet above the ground. There is a second airplane to the left of the tower. The second airplane is 500 feet above the ground. The second airplane is big. 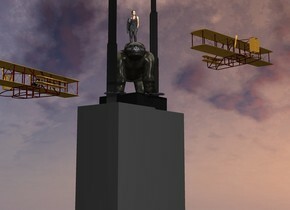 The second airplane faces the gorilla. The light is 2 feet above the tower. 1 feet above gorilla is a light. On top of the gorilla is a very big woman.